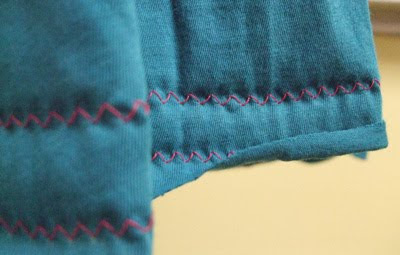 I livened up my teal coverup with hot pink zigzag stitches. Before I get into it, I want to explain my absence. I was on vacation. I wasn’t being lazy. Well, I was being lazy, but not at my house. MVH and I traveled to the southern part of Croatia, also know as Dalmatia. It’s a beautiful, sunny place, perfect for rocking my new-old beach coverups. 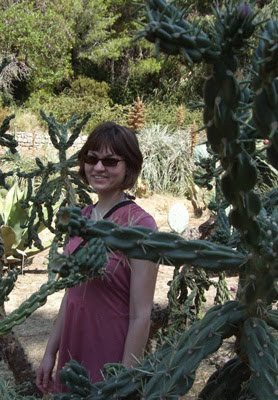 I pose among cacti on Lokrum island near Dubrovnik. The uneven dyeing of this coverup has faded. I’m curious to see what happens when I wash it. Both coverups — the dyed one and the Grecian-inspired teal one — went into my luggage. Two coverups may seem like overkill, but there was a lot of beach time, and the variety was nice. I was guaranteed one dry coverup at all times. OK. 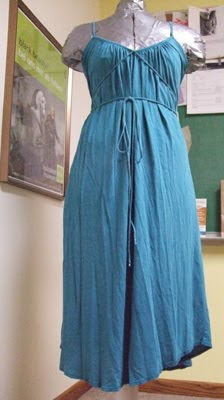 So I wrote about the dyed coverup, but what about the teal dress? Here’s what I did. I put it on my dress form and marked how short I wanted it to be. (I was aiming for a bit above the knees.) Then I took it off my dress form, laid it as flat as I could on a cutting mat, made some marks that reflected the desired length, and sliced the fabric with a rotary cutter. 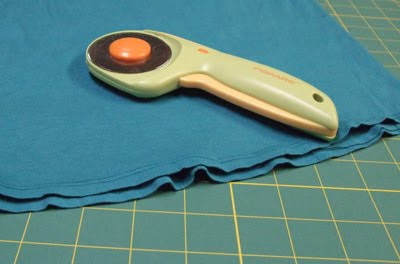 My Fiskars rotary cutter and self-healing cutting mat make slicing the knit fabric a breeze. MVH gave me the cutting board and cutter for Christmas a few years ago, and they rank among my top crafting presents. Cutting fabric is much easier with both these tools. I put the dress back on the form to examine what I had done. I was a bit shorter than I anticipated (whoops), but nothing scandalous. It is a swimsuit coverup. That means when I wear it, I’m wearing a bikini for underwear. That’s slightly questionable, but, in the right circumstances (such as walking to the beach with a bunch of other tourists), it’s standard operating procedure. Who am I kidding? Bathing suit as underwear feels like you’re on vacation even when you’re not. Try it sometime. 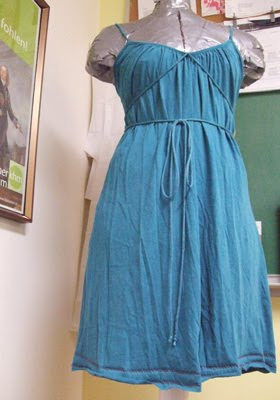 The teal dress was an unflattering length before I altered it. Back to the story. It was a wee bit short, but I went with it. I still wanted to add more polish to the hacked-off bottom. My solution: a few rows of zigzag stitching. It’s decorative, and it checks fraying, although knits really don’t fray. Knits, especially lighter knits, will roll, and the stitching tames the inevitable rolling. I went with some hot pink stitches. I used this functional/decorative zigzag trick in altering a formerly too-large concert T-shirt. I also used hot pink thread with the T. In case you hadn’t guessed, I like hot pink accents. When I started with the teal coverup, I wasn’t sure whether I was going to finish the bottom or leave it raw. I usually sweat the details and finish edges; I’m a bit of perfectionist, although I’m trying to tone it down. (I’m wound pretty tight a lot of the time.) I’m trying to convert myself into an excellenceist (comes with less stress and fewer unrealistic demands). 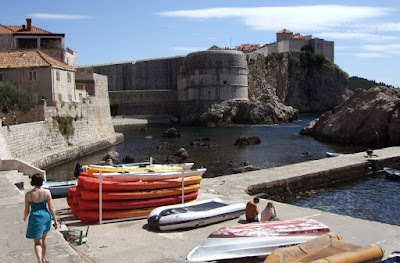 I walk outside Dubrovnik’s walls on the way to the beach. You can see how short the coverup is. It’s a really cute, young length. Yes, I’m wearing a bathing suit as underwear, and I love it! I think it was really good for me to attack this project without a concrete plan. 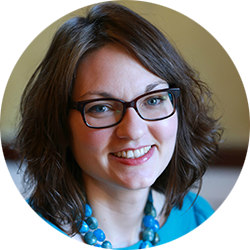 It forced me to be creative and to go with the flow, which can be challenging for me. It also forced to me to not view my lack of a plan and its consequences as mistakes but rather as opportunities for improvisation. Detail of the hot pink zigzags. Notice how the bottom rolls. So it’s a little short. So what? My options are don’t finish the edge, or finish it and make it even shorter. Hrm. Wait — how about some decorative stitching? It will take two seconds and look cute and funky. Hot pink! Super bonus! 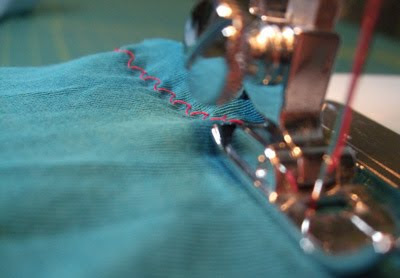 Who knew I would learn such deep lessons from modifying a thrift store dress?